While it’s common knowledge that consuming excessive sugar can lead to tooth decay, some of the lesser known facts about dental nutrition are just as important to keep in mind. 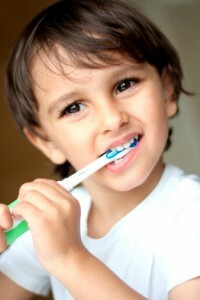 This is particularly true for children, whose tooth enamel is softer than that of an adult. At Dental Expressions in Oklahoma City, OK, Dr. Colin Holman and Dr. Natalie Frazier help parents from throughout OKC protect their children’s smiles from harmful decay. We accomplish this with children’s dentistry that includes routine exams, cleanings, patient education, and preventive treatments like sealants and fluoride. In addition to brushing and flossing your child’s teeth, you can make some small, simple changes to his or her diet in order to further protect against oral health concerns. These include eliminating excessive snacking between meals and offering a glass of water with every starchy or acidic food. If your children can’t wait for mealtime, don’t reach for chips or sweets; instead, try some sugar-free yogurt, a handful of almonds, string cheese, or a crisp apple. These all help to improve enamel’s resistance to plaque buildup. Celebrating Halloween is fun for children and adults alike, and we certainly won’t advise you to eliminate all the joy that comes from trick-or-treating for candy. It’s simply a good idea to limit the type and number of candy treats your child consumes in order to avoid the development of cavities. Steer clear of chewy candies that remain in the mouth for extended periods of time as well as those that are likely to get stuck between the teeth. To give your child’s smile extra protection from cavities this holiday season, call us and ask about how dental sealants and fluoride supplements can protect and fortify his or her teeth. Halloween is right around the corner and the rest of the fall and winter holidays will arrive shortly after. Keep your child’s smile healthy and looking its best with preventive and family dentistry services at Dental Expressions. We look forward to helping your little one’s pearly whites stay cavity-free not only during the coming holiday season, but all year long. Contact our office in Oklahoma City, OK today to schedule your child’s visit, and learn more about how various foods impact oral health. Our state-of-the-art dental practice proudly serves families from communities in OKC, Midwest City, Moore, Norman, and more.